Image courtesy of Get it? On the one hand, is it fun to try to spice up the front page of a newspaper? I’ll leave that to the design experts, but sure, whatever floats your boat. However on the other hand, using a big red CANCELLED graphic over a headline about a blizzard is awfully confusing. Just ask the readers of the Sun Journal in Lewiston, ME. Dozens of subscribers called in to the newspaper, according to an explanation posted by the staff, concerned that their subscriptions had been canceled. When in fact, it was just the paper’s intention to convey that a blizzard wouldn’t be arriving as predicted. No subscriptions were cancelled, the paper says. 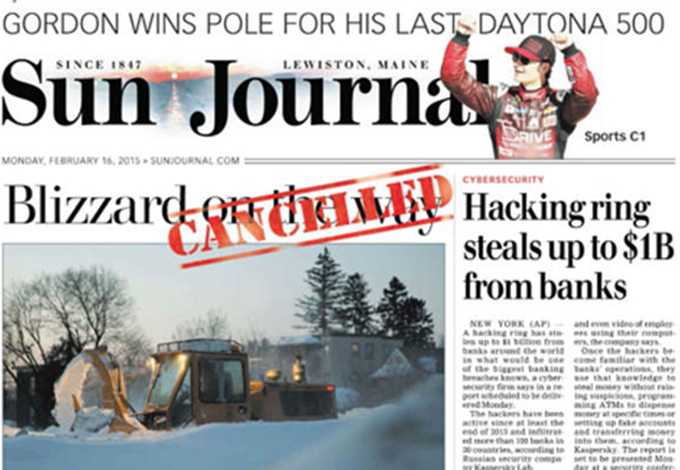 “The stamp was used as a graphic element to ‘cancel’ the underlying headline “Blizzard on the way,” indicating as boldly as possible that the much-unwelcome storm never materialized in our primary readership areas of Androscoggin, Franklin and Oxford counties,” the paper explains.